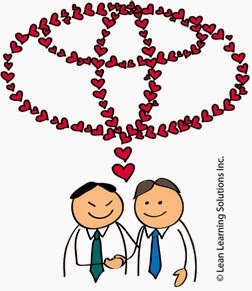 The Toyota Production System (TPA, aka ‘Lean’) is perhaps the world’s most powerful management system. Many people (including the Lean Pathways team & I) have dedicated themselves to learning & practicing its methods & mindsets, and to unlocking its mysteries. Practiced diligently TPS provides a bountiful harvest. Like all great systems, TPS can be all-encompassing. It can absorb practitioners to such an extent that we can lose sight of the most important things. Such as why are we practising TPS/Lean? What’s our Purpose? Strong companies & people define Purpose clearly & simply. They understand that Purpose (often called True North) must be simple, visual and compelling. Something for the head & something for the heart. And therein lies the challenge. It’s easy to forget about the heart. The Lean system, the methodologies & their interplay, is so engrossing that it absorb all our attention. All systems, including Lean, must support our humanity – not vice versa! Sadly, we all know organizations that lose sight of this fundamental idea. There’s a hollowness to them, an emptiness that ultimately limits their achievement. The history of the 20th century teaches us that supposedly “idealistic” systems can even turn monstrous when disconnected from humanity. So what’s this mean for the practicing manager and leader? Practice what I call the “Warm Heart Principle”: Easy on the people, hard on the process. It’s not all about efficiency. It’s about effectiveness, achieving both our head & heart goals. I am saying, keep your heart goal close. Let it inform the management system you are building. All systems must support humanity.